Carbo, Virginia, US - Members of the radical environmental Earth First! movement and a coalition of groups concerned with climate change called Rising Tide blockaded access to American Electric Power's (AEP) nearly 50 year old Clinch River coal powered electric plant. The demonstrators were calling for "an immediate halt to mountaintop removal and other destructive forms of strip mining." They also demanded that the Clinch River facility and other aging and polluting plants be closed down and that the nation look for "cleaner sources of energy" and vigorously promote electricity conservation. 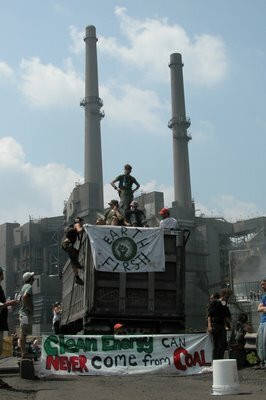 One activist suspended himself off the side of a bridge in a way which blocked the only access route to the facility. Additionally, a number of other individuals locked themselves to the bridge in order to make it more difficult for police to disperse the protest. A large coal truck was trapped on the bridge and occupied by protesters and had all of its tires deflated, as well as having one of the protesters locking themselves to an axle. After six hours the demonstration was concluded and the police released everyone who had been detained. They were unsure of how they were going to be able to move the truck and clear the bridge.